There’s nothing like a good fight between Sherlock and Joan. It’s a delicate thing. A fight simply for the sake of shaking equilibrium won’t really hit home, and they’ve already been through so much as partners that several topics would have to be reintroduced in advance before the match began. (You can’t have Joan meaningfully confront Sherlock on a sobriety problem, for example, without addressing the swiftly-sidelined overdose from the end of season three.) But when Sherlock and Joan square off in “Henny Penny The Sky Is Falling,” it’s about their deepest and most fraught concern: The Work. And by putting Recognition in between them, Joan and Sherlock get to have a fight that draws on their disparate personal experiences and drags them to an uncomfortable impasse with dark implications. Happy one hundredth episode, Elementary! 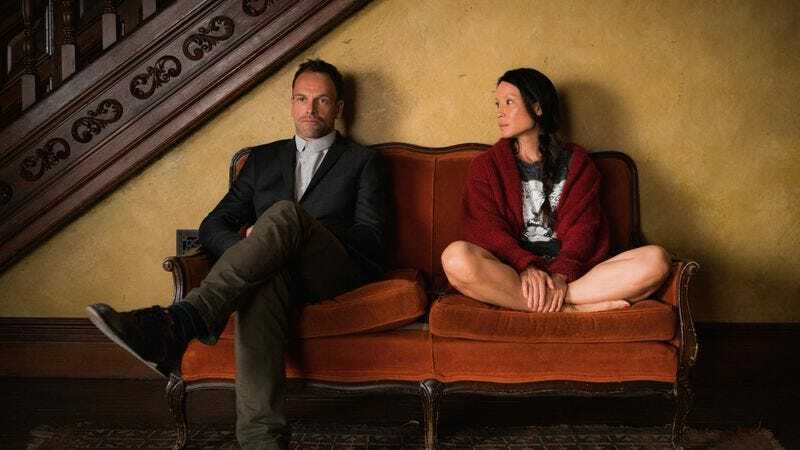 It’s great to watch Lucy Liu and Jonny Lee Miller have so much of an episode to themselves, especially tackling a problem that has no right side or easy answers. Though Sherlock may “eschew such recognition,” he’s keenly aware of the power of a symbol: he keeps those sobriety chips right next to where he works; he sits all night by Watson’s bedside in a way he hasn’t for a long time, in the hopes she might need him. And Watson’s claims that this isn’t a big deal—that it’s a minor accolade for teamwork that can be accepted like a passing compliment—are completely destroyed by the fact that she declined to let Sherlock know what was happening even after it was clear he was concerned to distraction. It’s fascinating in its casual cruelty. But he doesn’t call her on it; we know he needs her too badly to risk it. And now, so does she. After last episode, I talked about how favoring overly-complicated cases and skipping characterization could undermine the show. “Henny Penny” has no such problems. Episode writer Bob Goodman has a soft spot for character beats; “Turn It Upside Down” had the same sense of the case as B-plot for Sherlock and Joan’s own problems. And though the wrap on this case is the sort to make us scratch our heads and forget the whole thing, the first two acts of the investigation made tight circles around a man who told a lie that shook a community in ways not even the truth can do much about—it’s going to take ten years to unravel that bad math, and so it’s going to be ten years before asteroids have their day. Finding the killer isn’t going to do a thing about stopping the problem they have now. It’s a minor chord in counterpoint to Sherlock and Joan that plays out across the episode; it suggests the problem they’ve run into will have consequences. Sherlock is specifically afraid that recognition breeds resentment. Joan—well, we’re never entirely sure what Joan is feeling, but her assertion that you accept someone else’s priorities and then show up is a level of self-denial that’s kind of staggering coming from someone who has left two careers behind. (The framing of this quasi-reconciliation, side by side on the couch, facing the same direction and still fundamentally at odds, is telling.) But that sense of seeing the edges and blind spots in their relationship is what makes this fight hit home. “Henny Penny” gives them a chance to be two flawed people that have a problem; it’s a noteworthy shake to the equilibrium. Do I think Joan has somehow come to resent Sherlock enough to actively work against him? It’s unlikely. But this feels like something that has consequences, especially given our farewell beat. Joan is politely applauding, comfortable and confident among the detectives they work with. Sherlock has shown up despite his misgivings (he needs her too badly to risk it), but he doesn’t clap at all; he looks like someone locked into his own skeleton, preparing for the worst. After this episode, I’m looking forward to it. Sherlock’s past failures routinely come back to haunt him. This was the first time we meet one of Sherlock’s boarding school friends, and it’s no mistake that the entire encounter is designed to make Sherlock feel slightly like a fool. (Yes, the sun orbiting the Earth is a canon reference, but it’s one of those remixes Elementary can do so well that brings new context to old canon.) While I’m not sure Julius Kent can resent Sherlock nearly as much as Sherlock resents him, the banging of that childhood drum starts up almost at once; it’s a hint of what Sherlock may have experienced at Scotland Yard and lends weight to his claim when the argument comes. Speaking of which, it seems strange that Sherlock wouldn’t have name-dropped Lestrade for proof of how badly things went at Scotland Yard. This episode’s character work was everywhere; it even made time for Gregson to call Sherlock over to disrupt any potential anxiety spiral about Gregson’s meeting with the brass. Aidan Quinn always makes the most of Gregson as The World’s Most Reluctant Father Figure, and it’s a quiet beat of him being both very smart and very kind. Line delivery of the week: I didn’t necessarily want anyone to ever say “A poop emoji” out loud, but if it had to be someone, I’m glad it’s Jon Michael Hill. “I was eight when I made that mistake. You chose to wear that vest this morning.” Miller’s Sherlock can be such a delight. The Piazzi Telescope was a fun pick for a fleeting reference. Piazzi was instrumental in the discovery of dwarf planet Ceres, technically classified as an asteroid. Also fun: the poison ivy. I don’t know if Gregson’s “It amazes me” during the big speech is a deliberate callback to Watson and Sherlock’s pledges of mutual admiration back in the first season, but this episode has so many callbacks to their prior dynamics, let’s pretend it is. That second one-year sobriety chip being kept alongside the first one is, by itself, a more meaningful reference to Sherlock’s relapse than almost anything about it from last season. “You and your partner need to get straight what it is you want.” Please let this be a thesis statement for the season. And last but not least: Congratulations to Elementary on the 100th episode! May you frolic in television’s eternal spring.